Let’s just roll with that orange theme for one more day. I’ve been in a bread baking phase lately, so naturally Have Cake, Will Travel is the first site I hit when I’m ready to make a loaf. For some reason carrot bread sounded absolutely perfect this week. And it was. The crumb is light and moist, the color delightfully orange, and the loaf did rise perfectly like Celine said it would. Of course the winter light in my apartment doesn’t make for the most vibrant picture, but you get the gist. So go make a loaf! And have a fun and peaceful weekend! First, proof your yeast by heating your soymilk until it is lukewarm. Then add the yeast and sugar. Let it sit for 10 minutes until it is foamy. Add rest of ingredients, but with only 2 cups of flour (1 cup whole wheat, 1 cup bread) to begin with. Stir with a wooden spoon and pour the batter/dough onto a clean, lightly floured surface. Add flour as you knead until the dough isn’t too sticky anymore and is smooth and elastic. Place the dough in a large bowl coated with a little oil, cover, and let rise (in a warm, draft-free area) for 90 minutes or until doubled in size. After the dough is done rising, preheat oven to 375F. Punch dough down and flatten it with your hands in a rectangular shape. cut in two in length, roll each portion tightly in the shape of a loaf. Place on a parchment/Silpat-lined baking sheet and let rise for another 30 minutes. Bake for 30 minutes, or until the bottoms sound hollow when tapped, the top is golden brown, and if you have one: that an instant-read thermometer gives you a 190-200F reading. Celine is my baking/cooking hero – plain & simple. I love your mug, and did I tell you how cute that pine cone is? Adorable! The picture looks great, winter light and all! I love those tiny carrot chunks hiding in the bread! I’ve totally been into bread baking lately. 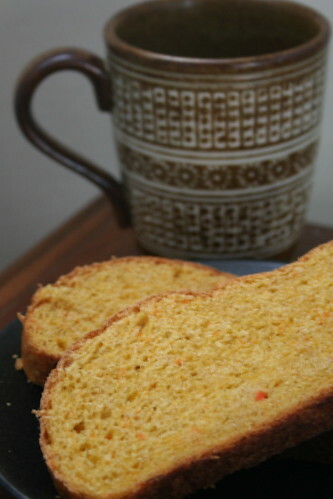 Your carrot bread looks colourful and perfect and of course, you can never go wrong with Celine’s recipes. Carrot bread? My mind just exploded. Amazing. Sounds yummy! And, judging from the recipe, it’s nothing at all like carrot cake, which is a plus in and of itself! What a great idea! It’s such a lovely orange-ish hue, too. pretty bread! Is is sweet? I’m imagining it with a little melty Earth Balance. Have fun at your party!